Diamonds in the Rough | Need a Streamer? Fantasy analysts say things like, “I know, I know, blind résumés are cliché,” and then proceed to do them anyway. So. I know, I know, blind résumés are cliché. But this is important, I swear. This is an exercise in perceived versus actual value, and exploiting market inefficiencies. Note: I wish I had written this a month and a half ago (June 21, to be exact), when I talked about it with my good friend/league enemy Rob. You’ll see why. If we are talking about players’ offensive skills from a traditional standpoint, you can argue that Player B is perhaps more valuable, given the comparable batting average, better on-base percentage and better isolated power (ISO). However, this is a fantasy baseball blog, and Player A is clearly the more valuable one as he leads all categories except stolen bases. The screenshot is from a pre-trade deadline conversation I was having with Rob. And if you haven’t caught on by now, Player A is Melky Cabrera, and Player B is Yasiel Puig. I set the blind résumé deadline at Sept. 5, marking Cabrera’s last game prior to missing the rest of the season with a finger injury. Honestly, their stat lines were less similar than they are now. Anyway, the important part to note is Cockcroft’s updated ranking are always going-forward rankings — that is, Puig will be a Top-10 player going forward. And on June 21, Cockcroft thought Puig was the 8th-best fantasy option available (Cabrera, meanwhile, 65th or so) despite him going almost a month without clearing an outfield fence. Things have changed, obviously. Cabrera was the better player in all categories since June 21 — in fact, his triple-slash rates are almost identical more than two months later, serving as a testament to his consistency — and his fantasy contributions have dwarfed those of Puig. Still, Cockcroft ranks Puig the No. 14 outfielder (40th overall) and Cabrera No. 20 outfielder (62nd overall). Elsewhere, CBS Sports’ Al Melchior still lists Puig as his No. 4 outfielder. (He has omitted Cabrera from his list given the news of his injury.) Michael Hurcomb, also of CBS Sports, lists Puig as his No. 4 outfielder and Cabrera at No. 15. 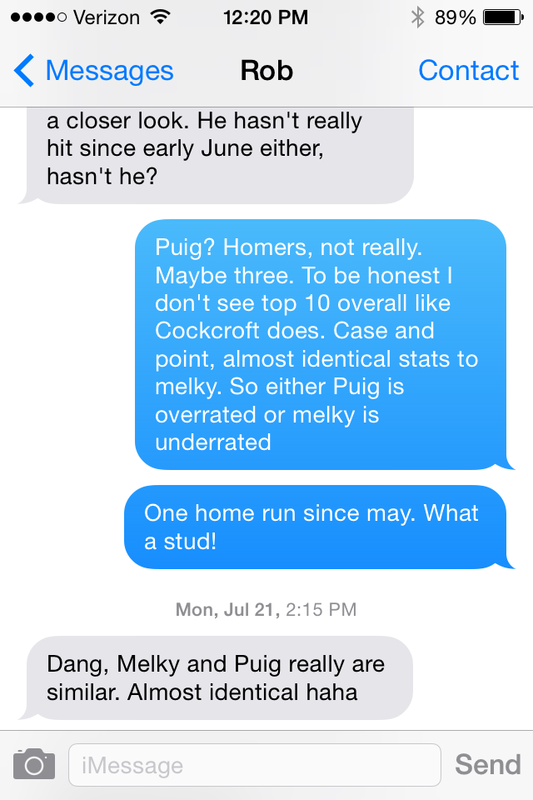 (His list was last updated Aug. 12, but it’s not like Puig wasn’t already slumping.) Only one of the three CBS Sports analysts, Scott White, seems to have some sense, ranking Cabrera above Puig (Nos. 11 and 15, respectively). Perhaps Puig is due to bounce back from a prolonged slump, which would justify his high ranking. But he had sported an abnormal BAbip (batting average on balls in play) all year; and while his 2013 BAbip was a monstrous .383, it would be wildly impressive for him to possess the hitting prowess to sustain one of the highest BAbips in MLB history. So, now, Puig owns a .353 BAbip, still well above the league average. It will take a larger sample size — namely, the addition of the 2015 season — to determine whether Puig is closer to his 2013 line drive rate or his 2014 rate — and, thus, whether he is closer to his 2013 BAbip or his 2014 BAbip. For now, I would err on the side of caution and bank on the floor rather than the ceiling. All of this slowly gets me back to my point: People have different perceptions of players’ values, and they often let other factors inhibit their judgments, even subconsciously. For example, people may still attribute Cabrera’s success to PEDs, a worry which seemed to be validated by his sub-optimal 2013 (during which he played through a herniated vertebrae, or something like that). Meanwhile, Puig is the next big thing, and people expect such from him. When you strip them of their names — from which their discrepancies in value stems, honestly — you uncover the market inefficiency lying within. Not that I can say that I would have had the foresight to trade Puig for Cabrera on June 21 (mostly because I owned both), but if I was offered Puig for, say, Corey Dickerson, straight up, I would have pulled the trigger. Because at that point, it was all about name value and recognizing the true performance of each player without bias. Dickerson, having arguably a better season than Cabrera or Puig, is ranked Nos. 17, 25, 32 and 40 among all outfielders on the four expert lists I mentioned. Moral of the story: Try not to let the name bias your projections. Exploit other owners’ misguided perceptions of value. Take a look at stat lines by two different shortstops since July 22. Player A is the Houston Astros’ Jonathan Villar. Player B is the Milwaukee Brewers’ Jean Segura. July 22 is the day Villar debuted. Like I said, Segura’s owners know he has been struggling, which raises a legitimate question: What should fantasy owners expect from Segura next year? I’ll guess most projections will split the difference between his first and second halves, but honestly, that may be too optimistic considering how long his struggles have lasted. Villar has gotten on base 8 percent more often than Segura has, which is a huge margin. Villar strikes out way too much — compare his 58 K’s to Segura’s 33 since July 22 — and that will likely weigh down his batting average. But his 10.8 percent walk rate is helping him get on base, which equates to runs and stolen bases. The Astros batted Villar lead-off for 12 games, but he struck out in one-third of his plate appearances before they pushed him down to the bottom of the order. Eighteen games and a .313 batting average later, they moved him back up to the lead-off spot. I’m probably alone in thinking Villar deserves any kind of hype for next year. He’ll be playing for a terrible team (which, really, won’t be as bad in 2014 as it was in 2013), so the potential for counting stats is not as promising. But a lead-off batter who can at least hit .250 and walk 10 percent of the time deserves a look, especially when the dude tries to steal basically every time he reaches base. Villar is the poor man’s Everth Cabrera, and I think he will at least rival Cabrera’s performance next year, if not exceed it. Villar will be among the top of my bold predictions when I make them next year, but you can have the spoiler alert now: Villar is a top-10 shortstop in 2014 with top-5 upside. As for Segura… I don’t know, man. Flash in the pan?